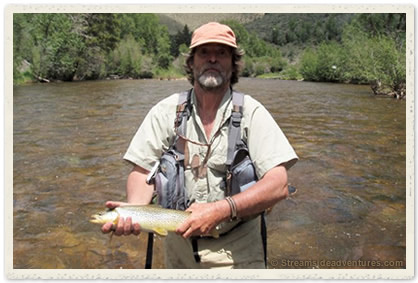 Known throughout the international fly fishing community as the “WIZ” for his uncanny ability to catch unsuspecting trout any place in the world, Norm Crisp brings a rare set of skills and experience to his fly fishing guiding, classes and seminars. Norm began trout fishing over 50 years ago as a young boy in the mountains of New Hampshire. Growing up with a trout stream bordering the front yard, trout fishing and playing in the brook were obvious ways to spend time after school. Most nights during the trout season Norm would catch enough trout for that night’s dinner. He quickly learned where to find trout throughout the season and what bait to use when and where. Following 3 years in the Marine Corps, Norm attended college in Kentucky where he earned an advanced degree in fisheries biology. In Missouri he earned an advanced degree in water resources engineering. Over the last 20 years Norm has fished throughout North America and around the world including New Zealand, Nepal, Russia, the British Isles, and in the Atlas Mountains of Morocco. In 1999, Norm formed STREAM SIDE ADVENTURES, LLC to provide summer guide services in the Upper North Platte Valley of Wyoming and year round in the Missouri Ozarks. In addition to guiding, Norm and other Stream Side Adventures staff members conduct on-stream classes on subjects ranging from seeing fish to streamer fishing methods. Norm has used his rare combination of education, experience, and great fishing stories involving his guests, as the basis for several articles on trout fishing. He is in demand as a speaker throughout the US and in England on topics such as “Fly Fishing Strategies”, “Fluid Mechanics for Fly Fishermen”, and “Traveling and Trout Fishing – Tips for Success”. Website: Visit Norm at Stream Side Adventures, where you’ll find further details about fishing opportunities is his region, and a great ‘tips & techniques’ section.